FUEL does not need too much to get your website started. Your ideas and concepts provide us the best source of what you want to achieve. It is our job to bring that to life online and in your other marketing material. Base items such as a company profile, logo, mission statement, images, etc always help. We value your opinion and ideas. The more input we receive from you the better able we will be to satisfy your needs and produce a site that will have the desired look and impact that you want. It's your website, we want it to look the way you want it. Listen - Learn - Design - Execute. Our mission is to build the best and most cost effective website for your business. With that in mind, we will carefully research your business needs and plan a strategy to create the ideal web presence. It all starts with an Initial Consultation to determine your needs. We work closely with you to determine your exact needs and desires. This helps us gather information about your company, services, audience, purpose, site goals, and more. After you are confident we have addressed all your ideas, questions, and needs, we provide specific recommendations and proposal for your project. We require 50% Deposit to start your work. After "you agree", "we agree" and paperwork is signed and faxed or mailed to us, we start the actual design process. If you do not understand the smallest of points at this step PLEASE ASK FOR CLARIFICATION! Miscommunication and false expectations do NOT move the design process forward in a productive manner. At ANY time please contact us about any concerns, questions or comments you have about your project. You will provide us with the text and any other content for your website and any specific pictures you would like. We can provide you with access to thousands of royalty free stock photos. We also offer optional professional copy writing services. We usually ask you to provide examples of websites you really like, colors you like, and your competitors' websites. If you want, you can also have a look at our past work and let us know any website elements you liked and we can incorporate the same for your website. 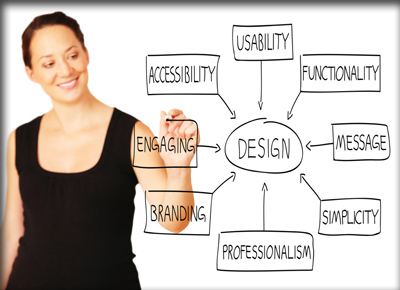 Design Selection & Finalization After the initial "layout" is designed, you will review it on our servers. We send you a web link to view the layout and ask if you would like any changes. You request revisions as necessary and then you provide final approval. After receiving your final approval on the final layout, we will then begin building the website and web pages, incorporating the design and all of the content that you provide. Pre-launch Evaluation- After the site is built, you will be able to view all pages to make sure everything is exactly how you want it. You will submit any desired changes to the copy and then give final approval before the site goes live. After final approval and payment has been received, your website will be published on your domain, and it will be live! We can register your domain name and host your website too - so you don't have to worry about technical aspects of your website and we become your one stop shop for your web presence. Ongoing Support- We are always available to assist in updating the website, helping set up emails or anything else you require.